The new Nissan NP300 Navara has arrived! The new pick-up has received a large number of improvements ranging from its comfort, efficiency and technology, to its practicality and stylish design. Nissan has an 80-year pick-up heritage and has created a beast of a vehicle to leave the rest in the dust. It has already scooped up the prestigious award for the International Pick-Up of the Year 2016. The main features of the NP300 include a new 5 link rear suspension for supreme comfort and state-of-the-art safety technology with forward emergency braking and an around view monitor. Delivering segment leading fuel economy and CO2 emission figures is the new 2.3-litre diesel engine. The engine comes in two variants including single turbo which produces 158hp, and twin turbo giving out a whopping 187hp. There is also the choice to have two or four-wheel drive and a six-speed manual or seven-speed automatic gearbox. Dual-ratio transfer case and hill descent control are fitted as standard. The new Navara provides the lowest fuel costs in its class with fuel consumption up to 44.9mpg and CO2 emissions as low as 167g/km. Superior ride quality and comfort is achieved in the new Nissan NP300 Navara thanks to its new state-of-the-art 5-link rear suspension system, available for the Double Cab model. This new package is 20kg lighter than the leaf springs in the previous model, improving the performance and comfort without compromising on towing capacity, durability and payload ratings. In the cabin, you’ll be surrounded by seats inspired by NASA and designed by Nissan to compliment the new 5-link suspension giving you a comfortable driving experience. Able to carry even the heaviest of objects the new Navara has an incredible payload of up to 1,136kg and a towing capacity of 3,500kg, which is 500kg up from the previous model. 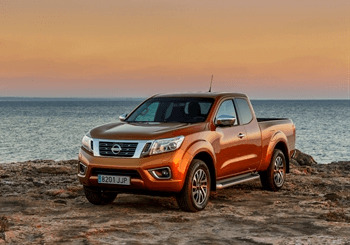 With a wide range of trim levels, you can tailor your Navara to meet your requirements of the most demanding of jobs. Flexible as ever, there are five distinct trim levels of the new NP300 including - Visia, Acenta, Acenta+, N-connecta and Tekna. Many of the new Navara’s advanced safety features are included as standard such as the forward emergency braking available on all double cab models. This technology scans the road ahead, warning the driver of any immediate dangers and automatically brakes if there is a risk of collision to avoid an incident. The around-view mirror allows the driver to have a 360 degree view of the area around the car when performing tight manoeuvres, reducing the risk of bumps and scrapes. With the NissanConnect package, the driver can have full control over the connectivity functions including Sat Nav, Bluetooth and multi-media audio system via a touchscreen. The New Nissan Navara hosts switchable driving modes; activate 2WD to optimise efficiency on the road and switch to 4WD to take advantage of the pick-up’s off-road capability. Advanced driving assists such as Electronic Limited Slip Differential (eLSD), Hill Start Assist and Hill Descent Control (on 4WD models) all come as standard to optimise the driver’s experience. If you would like to take a look at our range of Nissan vehicles, please don’t hesitate to visit us at Howards Nissan Weston-super-Mare.